We all remember coming of age, getting our driver's license and then pining after our first car. For most of us not born with a silver spoon, our first car was less than desirable, but now we look back on that old beater with fondness. Here are the best cars for today's coming of age. 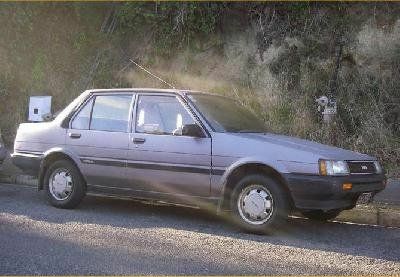 My first car was a 1984 Toyota Corolla sedan - a golden four door with cruise control and air conditioning. It was a 5-speed manual and I couldn't tell you what the miles per gallon were. I bought it with 155,000 miles on it and spent $650. A princely sum when your job pays well under four bucks an hour and is only part time. I have fond memories of that car. My parents firmly believed that buying a car for your kid only results in them wrecking it. That seemed to pan out, since all of my sisters were given cars and all of them got in wrecks. That little Corolla lasted until it hit 289,000 miles. I maintained it myself and put a lot of love into its care, though I wasn't exactly the nicest driver - I took that little car off road to various fishing holes and camping spaces often. 1 - Cheap to buy and insure. 2 - Reliability and easy maintenance so it's easy to care for and won't let you down. 3 - Absolutely nothing that can get your teenager into trouble beyond the ability to deliver them to it - i.e. no racing ability, no excessive "coolness", etc. Each of the following cars are great choices for the teenager. They can be had for under $2,500 and insured for very little. They're known for reliability and ease of maintenance too. These cars last forever. They are all over the place, easy to find parts for when needed, cheap to maintain, and are as reliable as it gets. Civics of this time period with over 300,000 miles on them are still on the road - and in abundance. One with 150,000 or so will cost well under three thousand to buy and will require only standard, routine maintenance to go another 150k. These are the same car with different badges. There are hundreds of thousands of these things on the road. They were the American-made (quote, unquote) competition for Honda, Toyota, etc. during that period and sold like mad. Their value depreciated fast, but they have a reputation for reliability and those that get retired are filling salvage yards, making parts cheap. These two generations of my favorite nostalgia mobile were as good as the one I had. A manual transmission is a must as it has far fewer problems. These cars are extremely reliable and very good get-around vehicles. Any newer than this and you're going beyond the $2,500 budget, but still getting a great car. Although the nameplate often gets joked about (today's Korean car is yesterday's Japanese one), these are as reliable as it gets. You also get a newer ride for the same amount of money. In gasoline or diesel, this car is a serious goer. German engineering means it's fun to drive, but not so fun that it can become a liability for your teen. The diesel version, if you find one that's proven to be a good one, will outlast nearly anything on the road. Want something a little bigger and (therefore, the logic goes) safer? Then the long-lived bull of cars, the Taurus, is your best bet. There's a reason these cars made it into so many corporate and government fleets. The 6-banger under the hood is probably the most reliable power plant Ford has ever made and these cars are literally everywhere. You'll never lack for choices to buy or parts to repair these. These cars are as long-lived as any you can name. They are reliable, practical, but uninteresting and thus safe cars. For the teenager in search of trouble, this car is a good deterrent. If World War III ever happens and there's a nuclear holocaust, then all that will be left are cockroaches and perfectly functioning Volvo 240s. These cars have more uber-high mileage clubs than any other I know of. Some are nearing a million miles. Similar to the Mazda, the Sentra from Nissan has become known as the go-to goer for those who can't afford to buy new. These cars definitely last and are easy to maintain since Nissan still made accessible motors during this time frame. There's a Chrysler and Plymouth version of this car as well, all with the same name. These cars have two advantages for the teenager (from the parent's perspective): the turning radius of a cargo ship and the acceleration of a flat barge. They sold in a big way to corporate and rental fleets and became so prolific on the market that finding one and the parts to maintain it is easy. Well, there's the list. One advantage to buying a car that's over a decade old is that if it were a lemon, it would have been retired by now. So chances are, if your teenager is buying an old, high-mileage car, and you do at least a little due diligence before purchase, you're probably getting something your child can remember fondly for years to come. It may not be the best or prettiest on the road, but it will get way more love (and teach a lot more responsibility) than the brand new, expensive ride the spoiled kid gets and then promptly wrecks. Got a favorite car you remember as your first? Talk about it in the comments below! These cars are reliable for their age but lack severely in safety. These cars (with the exception of the Taurus) are small and the IIHS has proven small cars are less safe. Even though the Taurus is a little bigger, it has no side airbags and didn't do all that well on the side test. The IIHS released a list of safest used cars for teens and suggest midsize or larger cars with stability control and good crash protection. While some budgets only allow for a cheap car, the IIHS recomends to pay a little more if you can. Motor vehicle crashes are the leading cause of death for young people and while there is no perfect car,you are most likely to survive in a decent sized car with up to date safety features and good crash ratings. Some of these cars have high death rates and horrendous crash test records. When buying a car for a teen safety should be a factor in addition to cost.